The advent of high-octane offenses have changed the way teams build their defenses. The 46 defense is a largely a relic as nickel and dime packages have become ubiquitous. Jon Ledyard breaks down the impact that defensive end Stephon Tuitt has had for the Pittsburgh Steelers pass defense. Since the turn of the century, the ever-growing prevalence of zone blocking schemes across the collegiate and NFL landscapes have changed the way offensive linemen are evaluated and valued. Where hulking people-movers were once desired across the board, athleticism and movement skills are now at a premium. The 2016 NFL Draft offered evidence of this fact, as slow-moving, big-bodied offensive linemen like Vadal Alexander, Sebastian Tretola, and Spencer Drango all fell to the draft’s third day, while traditionally undersized, yet athletic guards like Joe Thuney, Cody Whitehair, and Isaac Seumalo all went off the board by the middle of the third round. As this transition continues, so does one on the opposing side of the ball. The overwhelming dominance of nickel packages in the passing league of the NFL have led to the decline of the nose tackle position in favor of putting more versatile, athletic defensive linemen on the field at all times. Range and short-area quickness have never been more valued up front, as defensive coordinators work diligently to compete with the evolving type of player coming their way across the trenches. If you were sculpting the ideal modern 3-4 defensive end, your finished product would probably look a lot like Pittsburgh Steelers’ defensive lineman Stephon Tuitt. Blessed with incredible size at 6’5”, 305 pounds, Tuitt’s range and ability to play sideline-to-sideline sets him apart in a league searching for more players who offer his abundance of tantalizing traits. Tuitt (#91) aligns himself as a tilted 3 technique on this play from a preseason matchup with New Orleans, playing off the outside shoulder of Saints right guard Andrus Peat (#75). New Orleans runs outside zone to the right, and Peat is charged with reaching Tuitt’s playside shoulder to seal the defensive end inside. Tuitt plays it perfectly, however, exploding off the ball and winning the leverage battle by standing Peat up with a ferocious punch. Maintaining full arm extension and chest control of his opponent, Tuitt is able to win first contact at the point of attack and get his eyes to the backfield. Alertly tracking the ball carrier, Tuitt flows outside with the zone block before detaching his left arm just as running back Mark Ingram Jr. (#22) accelerates upfield. The Steelers’ defender meets Ingram in the hole with a resounding crash, dropping the back for a 2-yard loss. The technique and hand usage Tuitt displays on this play are brilliant, but there simply aren’t many defensive linemen with the power, range, and athleticism to carry a block effortlessly without losing any speed to the boundary. The Notre Dame product continued to make life miserable for Peat all night, beating him with a swim move on this zone run later in the game. Peat actually misses so badly that he falls to his knees here and is forced to wrap Tuitt up around the waist to keep the defensive end from making the tackle. What’s impressive about Tuitt here is his incredible quickness, not only to dodge the block, but to fluidly re-align his hips with the ball carrier while maneuvering into position for a tackle. Tuitt looks completely out of position to be able to make a play here, but check out how quickly he flips his hips and closes the gap to Ingram. If not for Peat’s hold, Tuitt likely has himself another tackle-for-loss based on his quickness off the ball and ability to fluidly change directions and recover pursuit angles. Tuitt’s skill set plays an instrumental role in what Pittsburgh does defensively in that it even allows the Steelers to gap-exchange him with an outside linebacker, trusting the 300-pound Tuitt with outside contain. The Eagles run a packaged play that Sam Bradford decides to hand-off based on the Steelers six-man box count. Philadelphia counters with a hat-for-a-hat on another zone run, but Arthur Moats (#55) pinches inside off the snap, disrupting the offensive line’s playside flow. With Moats attempting to squeeze the B gap, Tuitt executes a well-timed scrape/replace with the outside linebacker, punching right guard Brandon Brooks (#79) before hustling outside to contain running back Ryan Mathews (#24). As the ball carrier bounces outside, there is Tuitt, busting his tail to chase down Mathews for a minimal gain. It’s an exceptional play, not just because of the sheer athleticism required for a man that size to cover that much ground so quickly, but also because Steelers defensive coordinator Keith Butler obviously trusts Tuitt to gap-exchange and still be able to complete such a difficult assignment. The third-year defensive end’s unique skill set and elite range allows Pittsburgh to offer a variety of schematic options up front that make the Steelers that much tougher for offenses to prepare for during the week and execute against. 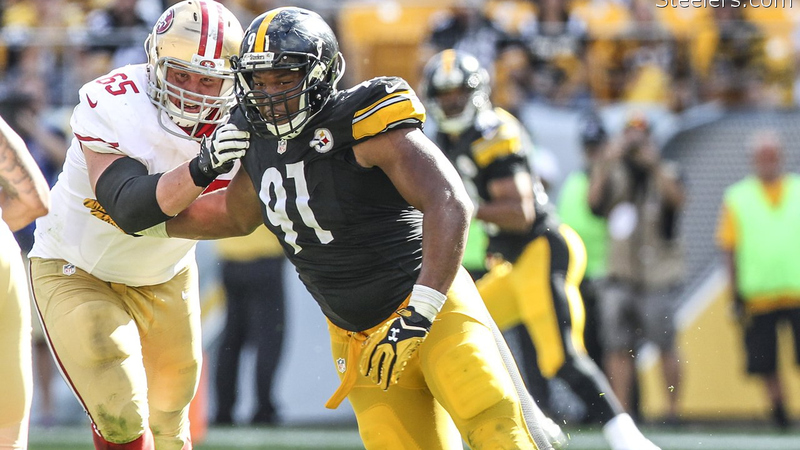 As Tuitt continues to grow as a pass rusher, thanks in large part to his work in the offseason with pass-rushing guru Chuck Smith, expect to see this young defender rapidly evolve into one of the league’s premier defensive linemen in 2016. Follow Jon on Twitter@LedyardNFLDraft. Check out his work here, including on whereAtlanta FalconVic Beasley needs to improve as a rusher, where San Diego Charger Melvin Ingram excels, sweet sacks by guys like New Orleans Saints‘ Nick Fairley, and more and more. All video courtesy of NFL Game Pass. Jon Ledyard has been writing about the NFL draft for several years now, and is thrilled to be bringing creative content and analysis to InsidethePylon.com. He lives with his wife Brittany in mid-western Pennsylvania, where the couple await the arrival of baby #1 in November. Jon also coaches football at the high school level, and works as a strength and conditioning trainer with the local sports teams. Jesus, Ryan Reynolds, The Office, LOST, weightlifting, ultimate frisbee, Duke basketball, and all Pittsburgh pro sports teams are his greatest passions.